A Queensland mother is calling for a popular brand of sunscreen to be pulled from shelves, claiming her son suffered severe burns after using the product that was meant to protect him. 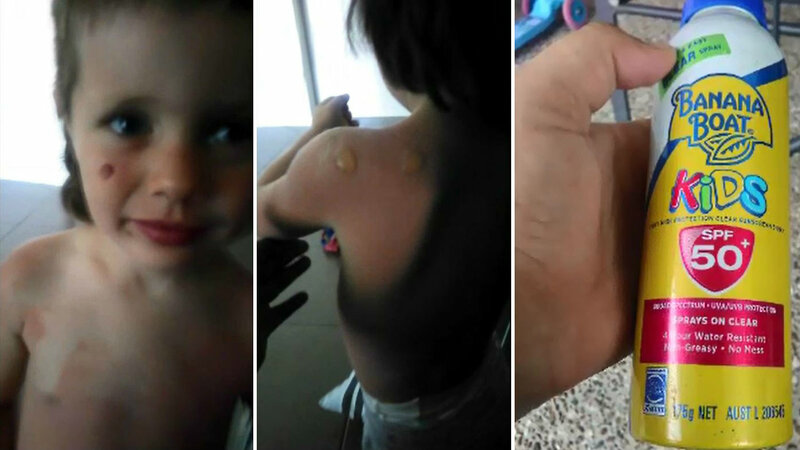 Kaylha Brown says an afternoon at the beach ended in agony for her three-year-old son after using Banana Boat&apos;s SPF 50 Kids aerosol sunscreen. "He woke up the following morning covered in blisters, I thought I&apos;d let it go for a day because he&apos;s just had a little bit of a reaction but they got worse so I took him down to my local GP and she stated he had superficial chemical burns to 40 percent of his upper torso," she claimed. Kaylha told A Current Affair she not only sprayed the sunscreen on her son but also ensured he was wearing a rash shirt and hat during the 2 hour outing, but he still suffered severe burns. "I don&apos;t see how it could be the sun if it was underneath his shirt, the sun doesn&apos;t reach underneath your shirt especially if it is a sun-safe shirt, it&apos;s from the product itself," she said. She claimed the ongoing effects of the sunburn were traumatising for her little boy. "He missed day care for almost two months, slept sitting up for the whole time, he still now has sensitivity and discolouration," she told A Current Affair reporter Chris Allen. The Ipswich mother isn&apos;t alone in her complaints after using Banana Boat sunscreen. Mathew Batarseh from Sydney&apos;s south-west said he was left with severely burnt and in extreme pain after using Banana Boat Daily Protect SPF 50 sunscreen. "I applied it two times within two hours and when I got home I slept. I woke up the next morning with bad burns on my body," he said. He too was forced to see a doctor. "She gave me this cream, a steroid cream, and I used it for about three days and then the next day my skin was sensitive, it was burning and itching and I had to stay in the shower for hours because I couldn&apos;t get out because my skin was too sensitive," he said. It&apos;s not the first time popular sunscreens have come under fire from customers, however, dermatologist Dr Natasha Cook said the product itself was not always the culprit. "First of all, there can be a reaction in that they haven&apos;t applied the sunscreen appropriately enough or the sunscreen itself may not be working, it may be expired or it&apos;s not a true representation of the SPF and you can get a sunburn," she said. "Secondly, people could be allergic to a particular ingredient in the sunscreen product, whether that&apos;s one of the actual sunscreen protecting agents or a preservative or something else." Dr Cook says application is key to avoiding sunburn and we&apos;re getting it wrong when turning to certain products. "From a dermatologist perspective, I really don&apos;t encourage the use of aerosol sprays for sunscreen application because they tend to only apply a fraction of what you need to get that SPF reading on the container," Dr Cook said. We are very sorry to hear about these customers&apos; experiences. While we cannot speak about their situations specifically, we want to reassure our consumers that they can feel confident using our products for safe and effective sun protection. We also want to stress that sunscreen is only one part of an important combination of actions people must take to protect themselves against the sun. No sunscreen - even SPF50+ products - provides 100 per cent protection from the sun. We always recommend our consumers apply sunscreen 20 minutes before sun exposure and apply at least every two hours and more often after swimming, excessive perspiration or towel drying.